Despite intially having the lead in sales versus the competing Boeing 707 the standard DC-8 was outsold handsomely by its Boeing rival due to the 707s better economics and Boeing's willingness to produce multiple variants for its customers. The short DC-8 also had many variants but this was partly due to its initial failure to meet performance guarantees. Nonetheless the DC-8 still sold in decent numbers and was the second most important of the long range jets of the 1960s. Plus its design characteristics gave it the edge over the 707 when to came to future variants. In this review we'll look at the short DC-8s covering the series 10s, 20s, 30s, 40s and 50s. 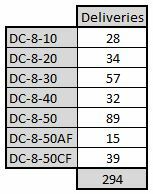 As you can see below deliveries equated to 294 aircraft, just over half of all DC-8s made. In 1/400 Scale the DC-8 was an early type to be represented with Gemini releasing one of their first moulds of the type in 2000. Aeroclassics tackled the Super 60 series first and didn't get to the DC-8-50 until 2008 and the earlier DC-8-10s until 2014. 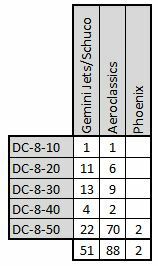 Since then however they have taken the lead on DC-8s especially as Gemini has more or less given up on the classics market. I feel like its a bit harsh to criticise the very earliest moulds made in this scale when the manufacturers were learning their craft however from a modern perspective the original Gemini DC-8 doesn't cut the mustard (the same can be said for their early 707) and this mould is vastly inferior to the Aeroclassics moulds which have come later. Having said that the general shape of the mould isn't too bad. On the negative side there are several features shared by several early Gemini moulds - namely the tail seam for fitting of the horizontal stabilisers, very simple and heavily recessed nosegear and thick poorly detailed wings. The whole mould also feels quite chunky like they haven't quite got the sizing correct and certainly in comparison to the later Aeroclassics mould (see below for a comparison of the moulds together) it is substantially larger. All of these failings mean that I only own a couple of models using this mould where there is no alternative. Hopefully soon new Aeroclassics releases will enable me to get rid of my Eastern and Northwest examples. Variants: Gemini released both series 10-40 and series 50 variants of the mould at about the same time. The only difference between the two are the engines and their pylons. It must be said that whereas the series 50 isn't bad the engines on the earlier series 10-40s are much too small and the noise suppression ring doesn't really fit the engine at all. Rather it hangs to the wing like a bauble on a Christmas tree rather than looking like part of the engine. Aeroclassics already had a very nice DC-8-62 mould when in 2008 they produced an equally lovely DC-8-50. This is one of Aeroclassics finest moulds and indeed its hard to fault it at all - though it does have a quite large wing seam join. About the only thing I can complain about is the undercarriage. It looks excellent but as with many Aeroclassics rolling gears it is very fragile and I have had quite a bit of hassle with wheels falling off and even the nose gear snapping. Quite often it is pushed forward by the packaging and being so flimsy it is hard to straighten again. Nevertheless the mould is excellent and I highly recommend it. I was a happy camper when, in early 2014, Aeroclassics released their new mould for the early DC-8s covering the series 10s, 20s and 30s as their series 50 and 60 moulds are sublime. However there was quite a lot of criticism of the new Aeroclassics mould when it first came out due to the angle of the inboard engines. This actually delayed me in getting it and I must say that the criticisms, though not unjustified, were made to look far worse by macro-photography. The real issue with the first two releases made (United Saul Bass and Douglas house colours) was in fact the size of the engines which were far too big. I am glad to say that Aeroclassics was quickly onto the issue with the engine and pylon size and refined it after the first two releases. It is now much better though the angle of the engines is still an issue from time to time. The mould, as with the DC-8-50 is excellent and the new engines also introduced a new feature - that of moving noise suppression rings, allowing in-flight or on ground positions to be shown. This is a nice feature though at their deployed ground position they do tend to hang poorly. There are plenty of early DC-8s to be made and Aeroclassics has been producing a nice selection including holy grails such as Panair do Brasil and Panagra. I look forward to plenty more in the near future.